Sometimes our shelter pets need special medical care. Stone Hill Veterinary Clinic, The Pet Hospital & Riversbend Animal Hospital have established an Angel Fund to help with medical costs for the dogs and cats at ARC – Mecosta County’s new animal shelter.Every dollar donated will go directly to helping these pets in need. Please ask how you can help. Lilly – As beautiful and delicate as her name implies, shelter life is not for Lilly. 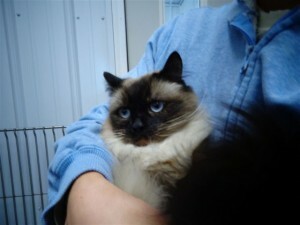 This gorgeous, long haired seal point Siamese came to us when her former owner had to move in with a relative who would not allow cats. After several weeks at ARC, Lilly stopped eating and lost weight. A visit to the vet to rule out medical issues (there weren’t any) just supported our fears that Lilly was not going to thrive at the shelter. We have since moved her into foster care and her sweet personality is blooming! Her Foster Mom says Lilly likes to lay on the couch and watch TV, follows her from room to room and sleeps next to her pillow at night. Lilly is 4 years old, front declawed and spayed. She needs to go to a quiet home, preferably with no other pets. If you are interested in meeting our Little Flower, please call ARC for contact information. Or, if you would like to donate to The Angel Fund to help cover Lilly’s medical bills, please contact River’s Bend Animal Hospital. 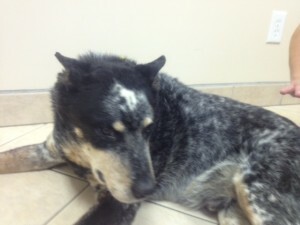 Darlin – This sweet dog was abandoned by the side of the road because his owners didn’t want him anymore. ARC took him in, but he needed some extensive veterinarian care. Darlin now has a happy life because a caring person has opened her heart to take him in. Please open your hearts and help ARC treat the special needs of this dog and others by donating to our Angel Funds. Darlin was treated at The Pet Hospital on Rose Ave in Big Rapids.